My wife writes a blog about raising triplets. It's humorous and entertaining. Several people have told her she should write a book. She chose to turn her wit on me yesterday. Suddenly, the humor was gone. It's all about the bus. 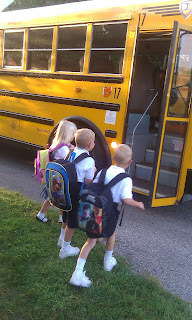 Before the first bus ride of the new school year had barely occurred, my wife posted on her blog, writing, "My husband is in love with the bus and insisted they ride the bus. My husband would ride the school bus to work every day if they would let him. I am sure of it." My kids want to ride the bus and my wife assumes its because I'm encouraging them to want to ride it. I might be encouraging, but I doubt my encouragement has anything to do with why they still want to ride. It's the experience--good and bad--that entices a kid. So, why is my wife writing about ME in her blog? If I could encourage my kids to want to ride the bus with such fervor, why can't I convince them to turn off their lights when they leave their room or eat their dinners better than they eat their snacks? Come on, wife of mine. If you listen to their oddball requests for a hot meal in a packed lunch, how can you ignore their wanting to ride the bus?